This residential frosted glass wall topper installation in Lake Elsinore, CA provides privacy while enhancing this homeowner's property. 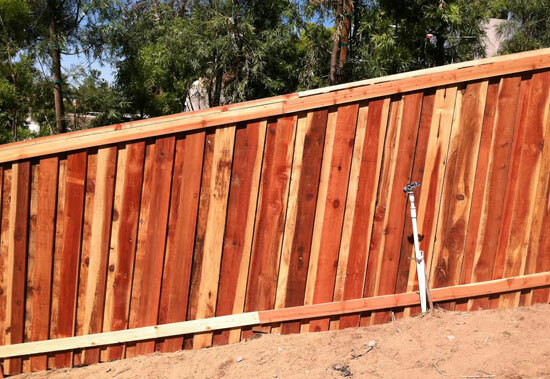 We installed this wood fence in Lake Elsinore, CA. 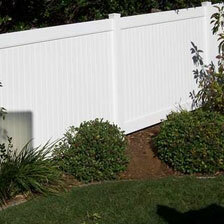 This residential fence installation features a cap and trim board and board wood fence. Affordable Fencing Company is Lake Elsinore's best source for vinyl, wood, aluminum, cinder block, chain link, and glass fences and gates. We've been in business since 1984 and have established an excellent reputation for our superior quality fencing services and highly competitive rates. Having installed more than 100,000 fences and gates on tens of thousands of properties across Southern California, we've also become experts in designing, constructing, and installing coordinating railings, patio covers, gazebos, and arbors. With our expert fencing services, we also provide free estimates, exceptional customer service, and some of the best warranties available on the market today. 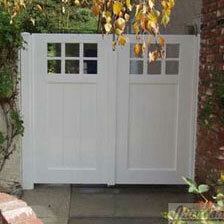 To consult with a friendly and experienced fencing expert, call Affordable Fencing Company. 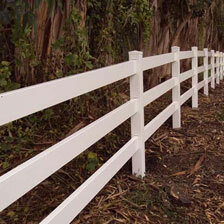 We are a full-service fencing contractor that is fully licensed, bonded, and insured. We welcome visitors to our showroom where they can get design inspiration and invaluable advice, as well as provide free on-site consultations. 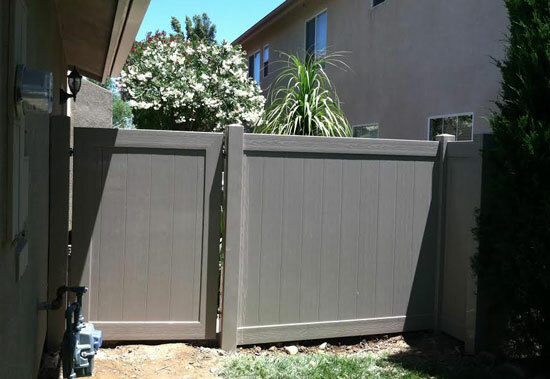 If you're tired of constantly repainting and repairing your wood fence due to weathering or termites, then consider installing a vinyl fence at your Lake Elsinore property. Vinyl is a very durable fencing material and requires minimal maintenance: It won't blister, splinter, flake, rot, peel, fade, sag, or warp; it isn't susceptible to termites or corrosion/rust; and it requires no painting or touch-ups. 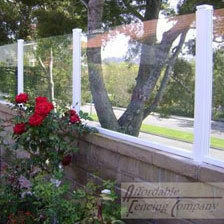 Because of these qualities and more, vinyl has become one of the most popular fencing options in Lake Elsinore. 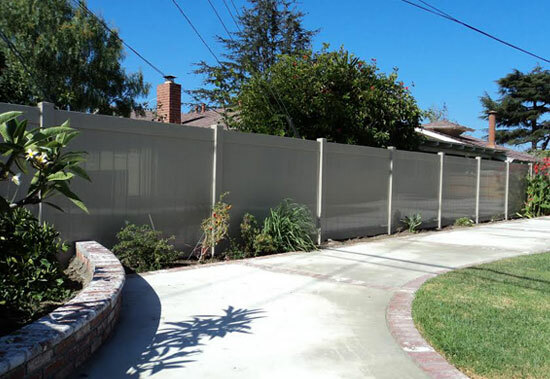 Additionally, when you choose a reputable vinyl fencing contractor in Orange County, such as Affordable Fencing Company, you can rest assured that your vinyl fence will be expertly constructed and installed to ensure longer lasting results. Choose from our privacy, semi-privacy, picket, and equestrian vinyl fences in Lake Elsinore, all of which are backed by a 50-year manufacturer's warranty. 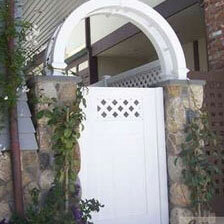 We also offer vinyl gates, gate arches, arbors, patio covers, and gazebos. 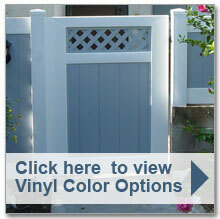 So, call us today to begin customizing your vinyl fence. 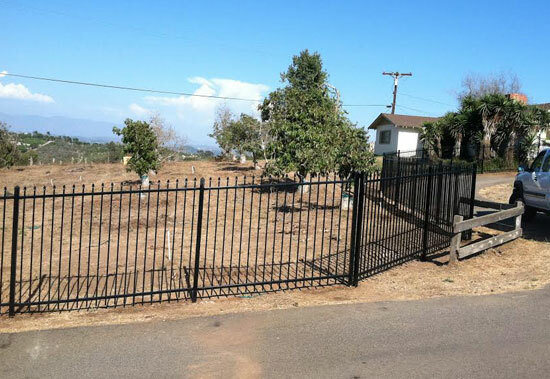 In business for over 30 years, Affordable Fencing Company has also been building glass fences, railings, and gates on thousands of properties in Lake Elsinore and beyond. From vinyl-framed glass fences with gorgeous colors and finishes to post-less glass fences with etched design work, our glass fences are custom built to the unique shape, size, style, and budget preferences of our customers. 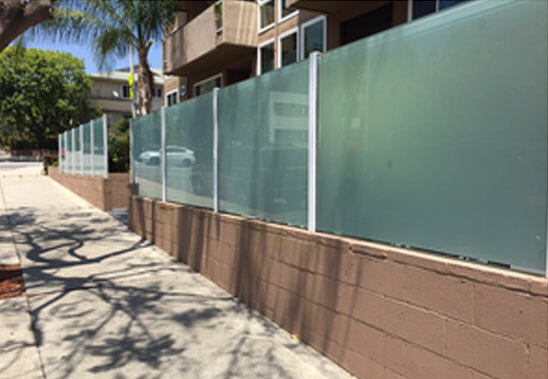 We use tempered safety glass, ensuring our glass fences, railings, and gates in Lake Elsinore deliver unsurpassed beauty and durability. Call today to find out more. With over 30 years of experience, flawless craftsmanship, and competitive rates, Affordable Fencing Company is Lake Elsinore's premier wood fence contractor. 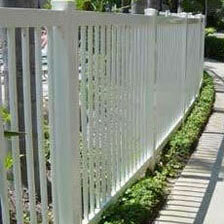 Our custom wood fences can be cut to nearly any size, height, or width, and are available in an array of styles. We offer those in Lake Elsinore privacy wood fences, semi-privacy wood fences, perimeter-defining wood fences, cap-and-trim wood fences, dog-eared wood fences, and more. We typically use redwood materials to construct our wooden fences, but can also accommodate requests for other wood species. Available in natural, stained, and painted looks, our wood fences are also very durable, ensuring they look great for years. Call today and receive a free consultation and estimate. Featuring a distinctively elegant look, our aluminum fences are extremely popular among Lake Elsinore businesses, residents, and homeowner associations. They are also very durable and fully customizable. Our aluminum fences come in black, white, bronze, green, and tan colors, as well as varying sizes and thicknesses. 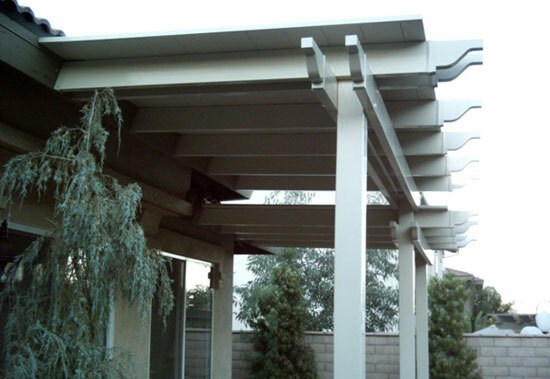 Lake Elsinore customers can also choose between flat or spear tops, as well as opt to combine our aluminum fences with wood or cinder block walls and posts. Reasonably priced, professionally installed, and backed by an impressive transferable lifetime warranty, our aluminum fences are a great value. Call today and learn more reasons why Affordable Fencing Company is Lake Elsinore's preferred aluminum fencing contractor. 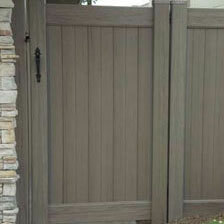 To complement our fence services, we also offer gate design, construction, and installation services in Lake Elsinore. We prioritize our customers' needs and offer a range of gate styles, including privacy gates, semi-privacy gates, double-entry gates, concave gates, motorized gates, picket gates, and custom gates. We also offer a wide range of beautiful gate colors and finishes, decorative lattice accents, flat-top gate arbors, rounded gate arches, stylish post-cap designs, and more. We have access to a diverse selection of gate hardware, including handles, deadlocks, latches, and motorized access controls. Plus, our entry and security gates in Lake Elsinore are affordably priced, backed by extensive warranties, and professionally installed. Learn more today. With a reputation for producing superior quality fences at affordable rates, Affordable Fencing Company is one of the best contractors you can hire for pool fencing in Lake Elsinore. We offer custom glass pool fences, aluminum pool fences, and vinyl-reinforced aluminum pool fences, as well as matching pool gates. 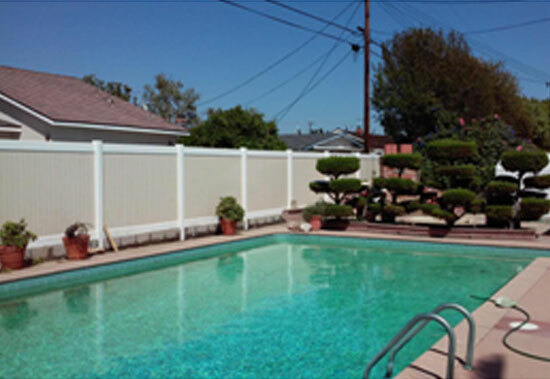 Whether for a private residence, hotel, or community association in Lake Elsinore, our pool fences and gates meet with the strictest of standards and are always installed in a timely manner. 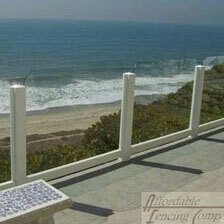 Our pool fences can also be customized to suit a variety of functional and style preferences. 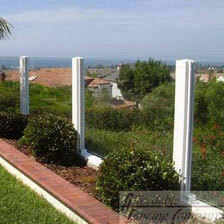 Call today to learn more about our pool fences for Lake Elsinore. Contact Affordable Fencing Company today if you want to enhance your Lake Elsinore property with a patio cover, railing, arbor, gate arch, or other structure. We offer free quotes, great prices, excellent warranties, and flawless workmanship. Each of our arbors, arches, railings, and patio covers in Lake Elsinore are crafted with the utmost care from premium-grade vinyl materials, delivering unparalleled performance. They require little maintenance and resist peeling, flaking, blistering, and warping for years to come. Plus, we offer a wide array of custom color, texture, finish, and other options that will suit almost any functional or decorative need.